Galveston-Houston welcomes one of largest groups of new Catholics in U.S.
HOUSTON (CNS) — Laurel Devins couldn’t help but smile when she saw Ella Claffy be confirmed by Cardinal Daniel N. DiNardo of Galveston-Houston during Easter Vigil Mass at the Co-Cathedral of the Sacred Heart in Houston March 26. Angel Lopez, 10, was a bit more sheepish when describing St. Gabriel the Archangel, his confirmation saint. He deferred to his mother, asking her to help him explain Gabriel’s importance. “He’s nervous,” she said, laughing. He said he was excited about all of this, and that he appreciated all of his friends and family who stayed through the late-night Saturday Mass. His big grin said it all as he waved to them in the adjacent pews. Devins, Claffy and Lopez were among the 2,240 candidates and catechumens welcomed into the Catholic Church in the Archdiocese of Galveston-Houston. That number is thought to be the highest for any U.S. diocese. 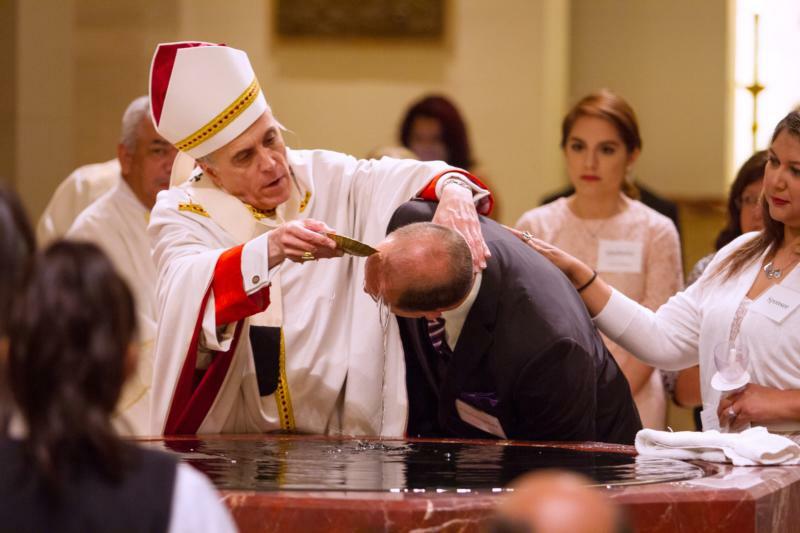 Catechumens are those who have never been baptized; candidates are those baptized in another Christian denomination who want to come into full communion with the Catholic Church. The catechumens received baptism, confirmation and first Communion at the Holy Saturday services, while the candidates made a profession of faith, were confirmed — if they had not already been confirmed — and received the Eucharist. About 80 of the nearly 200 dioceses in the United States reported numbers for 2016 to the U.S. Conference of Catholic Bishops. Two other archdioceses with large numbers of candidates and catechumens were Los Angeles, with 1,638 new Catholics, and New York, with 1,613. She finds solace in the current Jubilee Year of Mercy: Mercy is forgiveness, “and trying to reach out to those who are in pain because of wrongdoing and even accepting peace,” she said. She’ll soon marry a lifelong Catholic, and decided that becoming Catholic was the right move forward in their relationship. “It’s been so welcoming,” Devins said of her experience becoming a Catholic. “I’m very glad to be a part of it.” She was a Methodist.